Black magic is making headlines as a group of actual witches have been bold enough to publicize a planned hex on Brett Kavanaugh on October 20th in New York City. Ever bolder, those practicing demonic rituals and perverse magical rites no longer feel public condemnation in our post modern society. Could there be a clearer sign of a Christian nation that has lost its way? Witchcraft has existed within Western Civilization for millennia as a broad collection of practices ranging from pagan mysticism to demonic magic practiced by witches who draw their power from the Devil. As the 20th century drew to a close, the number of self-identified witches had steadily fallen in the United States and was estimated at just 8,000 in the early 1990's. According to three large-scale surveys by Trinity College, their numbers had fallen until the twenty-first century brought a resurgence of occult practices that resulted in a community of at least 340,000 Wiccans by 2008 and around the same number of pagans as well, for a total of 680,000. 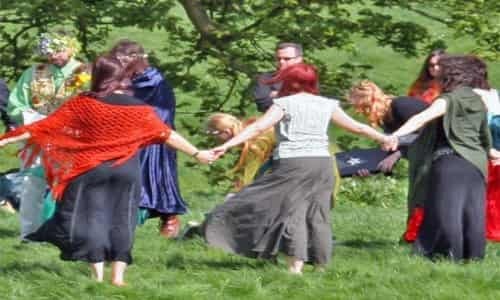 The Pew Research Foundation has continued the work of Trinity College and provided a broad estimate that put the number of Wiccans and pagans at between 1 and 1.5 million in 2014. This frighteningly fast growth of witches in the United States is believed to have continued to expand to fill the spiritual void left by Christianity's losses among the millennial generation. It is telling that practicing witches, estimated at up to 1.5 million, now outnumber the1.4 million members of the mainline Presbyterian Church, and their ranks continue to swell and gain recognition in society, even as the church struggles to maintain itself. Witchcraft proper, though dating back in some form thousands of years, saw a significant evolution in the mid-20th century with the Wicca label that repackaged the belief system as a pre-Christian paganism centered on Earth worship and nature spirituality. This seemingly moral-neutral rebranding appealed to many young men and women looking for a set of beliefs that lay outside the mainstream of society, and Wicca grew. Subsets of the culture focused on identifying with feminist ideology or pagan environmental concerns, but the common thread that ran counter to both modernity and Christianity was occult magic. Another significant subset of this now 1.5 million strong group of witches actively identifies itself as followers of Satan who endeavor to use dark magic in the world today. These witches have built communities online and attracted followers through social media as they present an attractive,softer female face to what is neither more nor less than the work of the devil. Instagram and YouTube now give voice for these witches to act as "influencers" not for fashion brands but for Satanic ideologies, and millions of teens are following along. In New York City this October 20th, we will witness how the Me-Too movement has now intersected with the feminist façade of the truly Satanic subset of witchcraft that has proliferated in American society. It is on this day that a group of witches has announced a public gathering to place a hex on new Supreme Court Justice Kavanaugh. The anti-male group of female witches declared their intentions in a public statement that declares, "We are embracing witchcraft's true roots as the magic of the poor, the downtrodden and disenfranchised and its history as often the only weapon, the only means of exacting justice available to those of us who have been wronged by men just like him." It invites others to attend as it promises to attack the powerful and perverse in society, "Please join us for a public hex on Brett Kavanaugh, upon all rapists and the patriarchy at large which emboldens, rewards and protects them." Already more than 1,100 have pledged to attend as participants,with an additional 11,000 potential attendees, according to the Facebook page for the event. Occultism was once understood to be a dangerous dabbling with the powers of darkness and evil, but in recent years has been painted in a morally ambiguous or even positive light. For those who know their Bible, witchcraft derives its power from Satan who is a past master at counterfeiting God's power and glory. The Bible is unambiguous in its warnings and prohibitions vis-à-vis witchcraft, and we ignore these words of caution at our peril. Satan tempts mankind with the promise of personal power derived from a source other than Almighty God. To accept this, or even to dabble in the occult, is to invite the perverse and evil where we should be worshipping the Lord. Sadly, millions of millennials are now vulnerable to this line of thinking and have fallen prey to this cult of Satan, thinking that they are merely expressing themselves. Wanda Alger is field correspondent with Intercessors for America and a pastor at Crossroads Community Church in Winchester, VA. Speaking in an interview on the topic of spiritual warfare between adherents of witchcraft and Christianity, she said, "The sad thing is that these millennials who are exploring the dark side of the supernatural have more faith and belief than most Christians. Because they are open and spiritually hungry, the spirit realm responds. The biggest hindrance to understanding the realities of the spirit realm is unbelief." The hallmark of the Last Days is deception and one of its manifestations among so many mainline protestant churches is this new fascination with the occult. It is the inevitable consequence when Christ has literally been forsaken and replaced by the Devil. And society, in hundreds of thousands of cases, doesn’t bat an eye. Justice Kavanaugh isn't the first, nor will he be the last political figure to incur their wrath.